We are on a household mission this month to eat healthier. A really big part of our plan is to cut down on carbs. It’s so very hard since I literally think about pasta and pizza and croissants and bagels constantly throughout the day. Instead of thinking about this healthier low-carb eating plan as a diet where I can’t have the things I want, I’m trying really hard to think of all of the delicious recipes that I can have so there is something to look forward to. 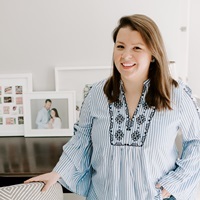 I’ve been digging through Pinterest, tearing out healthy ideas from resolution-fueled January issues of my favorite magazines, and brainstorming like crazy to concoct new recipes with a better-for-you twist. 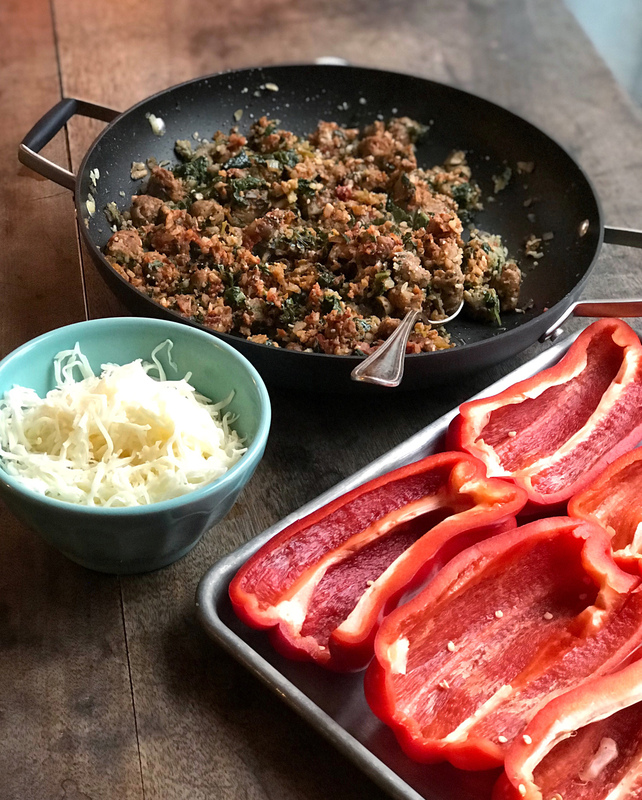 I’ll admit, healthy recipes have never been a focus on this blog (I mean, I posted about BBQ chip crusted mac and cheese and three ideas for loaded potato skins earlier in the week), but I really am trying to turn a new leaf and give it a try. 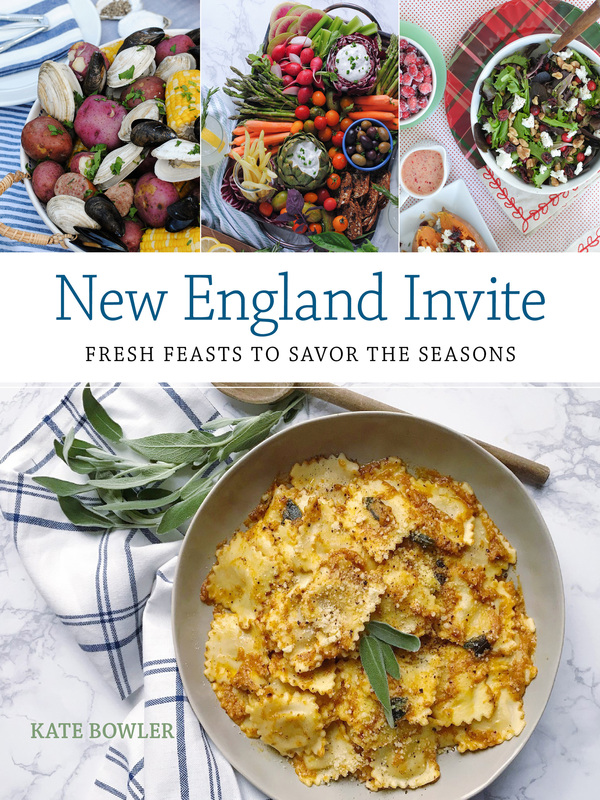 Last week we made roasted eggplant rollatini, chicken enchilada roll-ups, we roasted spaghetti squash instead of pasta, and taste-tested just about every cauliflower-based product that Trader Joe’s sells! 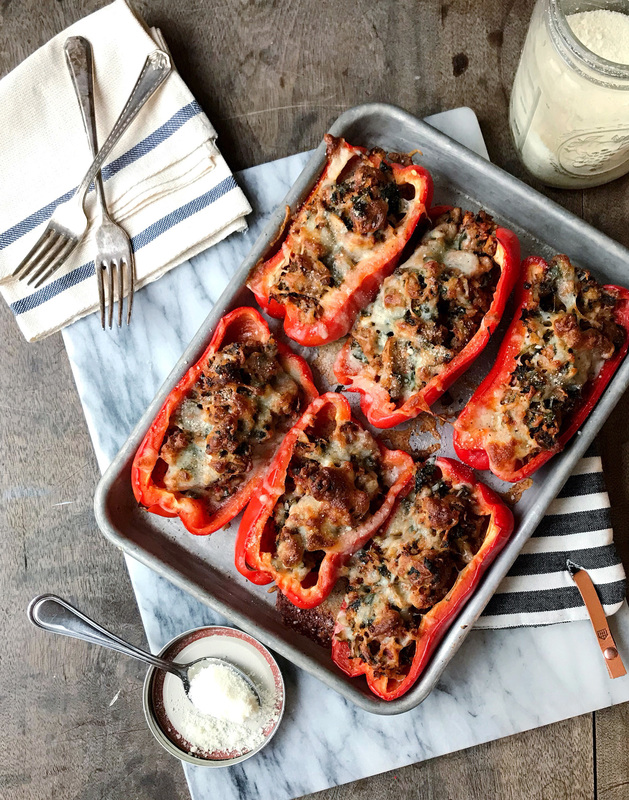 This week, I thought it was time to get experimenting with my own take on these low-carb, healthy-ish meals, and started with a new spin on stuffed peppers. 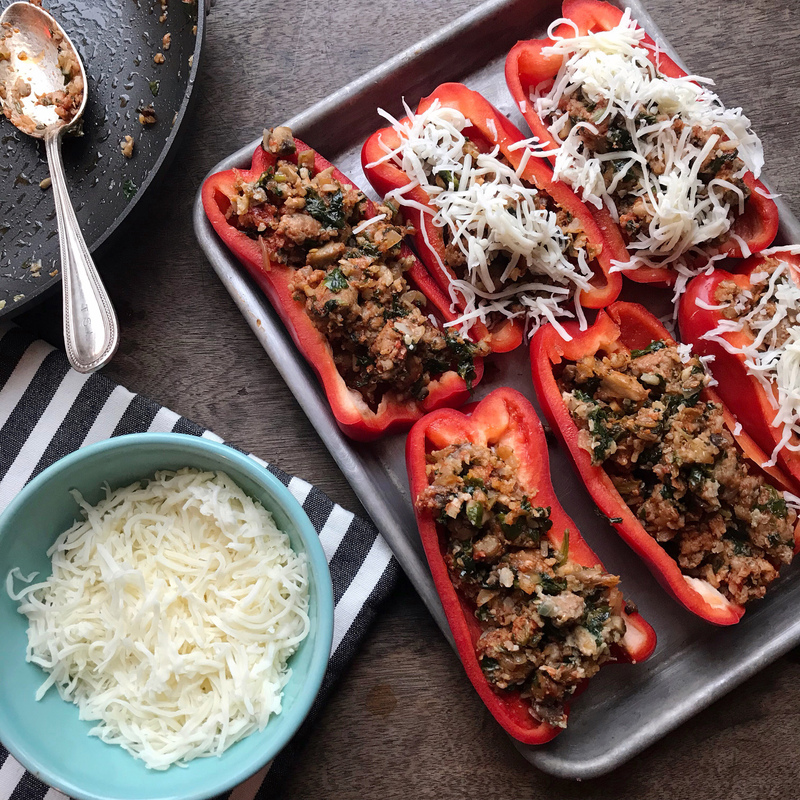 I’ve made stuffed peppers in the past with a Mexican-spin (see my Turkey Taco Stuffed Peppers), and decided on an Italian version for this recipe. 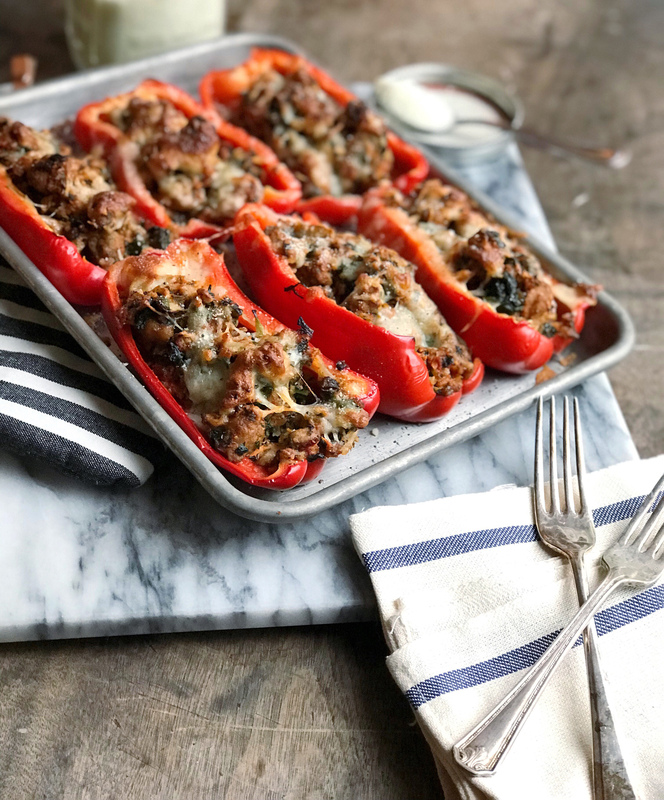 The stuffing inside these peppers is made up of crumbled sausage, sautéed spinach with onions and garlic, and cauliflower rice instead of regular rice. I also used finely minced mushrooms which helped absorb some of the liquid in the stuffing and helped keep it all together. A tiny bit of tomato paste added flavor and created a sauce to tie the ingredients together, and then a sprinkling of mozzarella cheese went on top before baking them in the oven. The true test of these recipes is always my husband’s review at dinner, and he gave them two thumbs up and excitedly packed up the leftover for lunch tomorrow. Maybe eating healthy isn’t so bad after all? Preheat oven to 375 degrees. Slice each bell pepper in half to create two pepper boats for stuffing, and remove the inner seeds and stem. Place the hollowed out peppers on a baking sheet and lightly season with salt and pepper. In a large pan, remove sausage from casing and start to brown it over medium heat. Dice half a yellow onion and add it to the pan while the sausage is cooking. Once the sausage is nearly cooked, add the riced cauliflower, finely minced mushrooms, and diced spinach to the pan. Continue to cook until the cauliflower has softened, and the spinach is fully wilted. Stir in the tomato paste, oregano, garlic and onion powder; cook an additional 2 minutes to combine the flavors. Take the pan off the heat, and stir in the parmesan cheese before dividing the sausage mixture into each of the 6 red pepper halves. 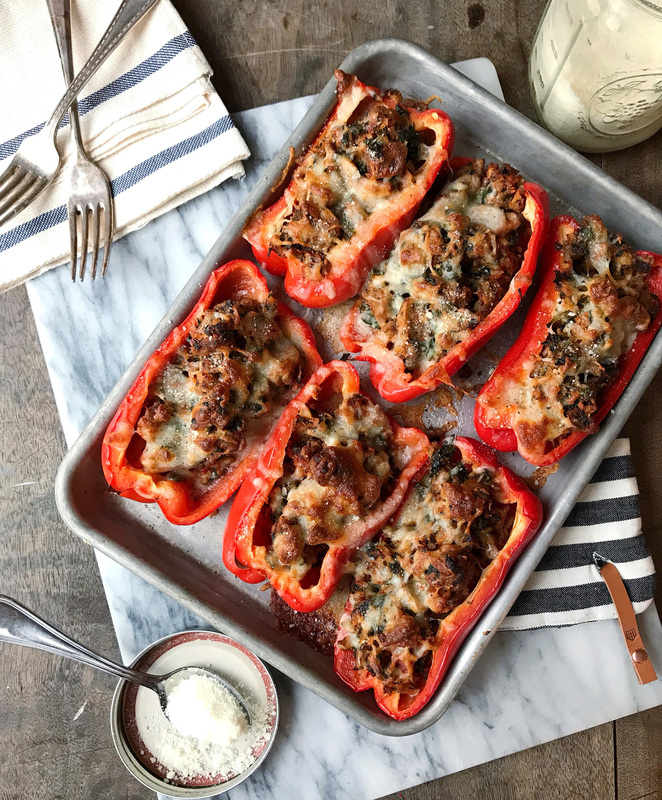 Top each filled pepper with a sprinkle of mozzarella cheese, and place the baking sheet in the oven. Cook the peppers for 25-30 minutes, until peppers are tender and the cheese is fully melted. Turn the broiler on for the last minute or two of cooking to give the cheese and pepper edges a crisp. Serve hot with red pepper flakes and additional parmesan cheese. Jane’s First Birthday Party. Football Popcorn Bar. One Response to "Sausage and Cauliflower Stuffed Peppers."